I wear my pretty, eye catching wrap bracelets from Beautiful Silver Jewelry all the time. 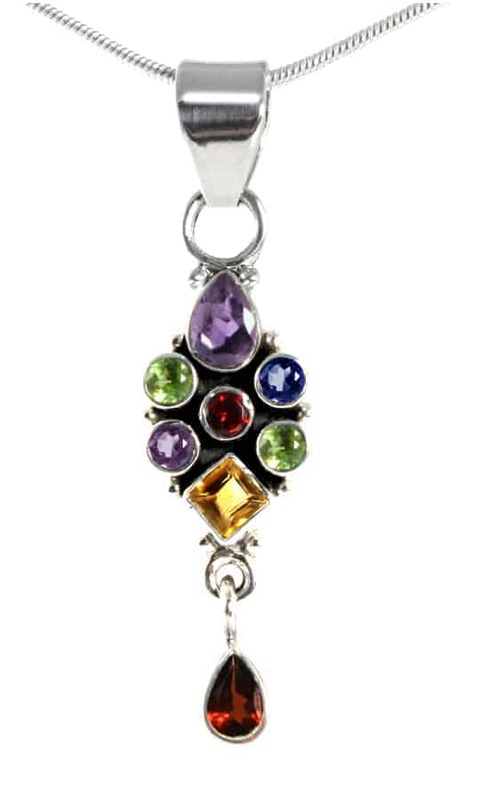 Recently, I added the stunning 4.5 Carat Amethyst, Garnet, Citrine, Peridot and Iolite Gemstone Sterling Silver Pendant Necklace ($55) to my jewelry collection and I love it. This beautiful necklace is visually stunning with sparkling gemstones that shimmer in the light. I really like that it has a longer 18” sterling silver snake chain that hangs so delicately just above the décolleté so it is timeless and feminine. The 4.5 carat gemstones are round, square and pear-cut and set in sterling silver. This necklace is very versatile and is great for the office, out to dinner and for special occasions. Beautiful Silver Jewelry puts great attention to every detail in this exclusively designed necklace. It even comes wrapped in a pretty silver foil box with bow so you can purchase one for yourself and give one as a gift. In fact, this would be a perfect gift idea for Mother’s Day! What I like most about Beautiful Silver Jewelry is that the pieces in the collection are fashionable, high quality and yet affordably priced. You are invited to visit Beautiful Silver Jewelry to purchase the 4.5 Carat Amethyst, Garnet, Citrine, Peridot and Iolite Gemstone Sterling Silver Pendant Necklace for only $55 or browse the entire collection of sterling silver jewelry, gemstone jewelry, CZ & Crystal jewelry, bracelets, earrings, necklaces, rings and more. I love the Custom Designed 5.8 Carat Sky Blue Topaz and Amethyst Sterling Silver Pendant Necklace, 16 Inch Chain. I too love the Sterling Silver Jewlry!! My favorite was the Pear shaped Blue Topaz pendant with 16 in. chain. Very different but gorgeous designs!!! I love the Super Cute Sparkling Crystal Cuff Bracelet, Get Bling! I like the Sterling Silver 3 Carat Pear-cut Garnet Pendant Necklace with 18 Inch Snake Chain.